Whether we are eating strictly gluten free because we’ve been diagnosed with celiac disease via the “gold standard” diagnosis or we’ve come to living gluten free via another path, I think we can all agree, much more needs to be done in the area of celiac research. It is estimated that about 2.5 million individuals with celiac remain undiagnosed and more develop celiac each day. Clearly, celiac disease needs more attention. So I was very excited to hear about the Celiac Disease Genomic Environmental Microbiome and Metabolomic Study (CDGEMM) being led by Dr. Alessio Fasano, one of our foremost experts on celiac disease. (You’ll find many references to Dr. Fasano here on gfe, including my write-up and review of his book, Gluten Freedom: The Nation’s Leading Expert Offers the Essential Guide to a Healthy, Gluten-Free Lifestyle, here.) Infants are needed for celiac study because “seeing” how celiac can develop is critical in understanding this disease—and ultimately figuring out how best to treat celiac disease and even prevent it in the future. “We are currently recruiting for an incredibly ambitious, one of a kind study that aims to predict and prevent celiac disease and would love your help in getting the word out. We are currently at 130 infants in the U.S. and looking to hit 150 by early 2018! The CDGEMM Study is aimed at understanding the role that our genes, gut microbiome, and environmental factors play in the development of celiac disease. Infants in the womb or 6 months or younger who have a first-degree relative (parent or sibling) with celiac disease are eligible to participate in the study, and we are currently recruiting from all over the country. A major goal of this study, led by Dr. Alessio Fasano, is to create a model to identify a pattern of gut bacteria (microbial signatures), in combination with environmental factors that could help us predict who will develop celiac disease before it happens. Once we are able to predict CD development, then our goal is to prevent it by developing treatments based off of this work. 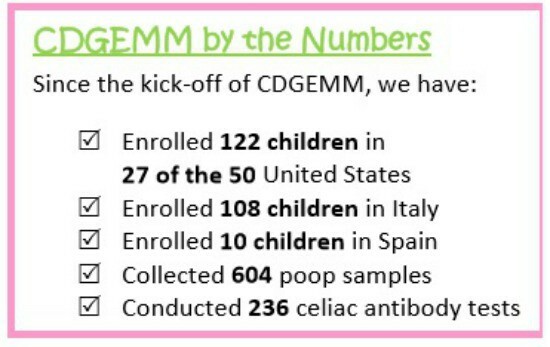 We are looking for 500 infants (our precious “GEMMs”) to participate overall, and currently have enrolled 264 babies in the US, Italy, and Spain, but are looking to find more CDGEMM participants across the country! Infants in the womb or aged up to 6 months who have a first-degree relative (parent or sibling) with celiac disease are eligible to participate in the study. (The risk of developing celiac disease is increased to 8-15% in this specific population as compared to 1% in the general population.) We are currently recruiting from all over the country, as well as at centers in Italy. The study follows the child from the time of enrollment until they turn 5 years old. Participants have a first-hand, active role in ground-breaking science and around-the-clock access to the CDGEMM study team, comprised of experts in the field of celiac disease. Participants are also welcomed into a community of like-minded families, as we all work collectively to improve our knowledge of celiac disease. Are Participating Infants Required to Consume Gluten or Adhere to Any Special Diet? While studies related to celiac have been few and far between in the past, I have still been reluctant to share information on the majority of them because they have required participants to eat gluten. So I was very happy to see the following answer to this question. Are Their Costs Involved and Is There Compensation for Participating in This Study? “Everything is free of charge for the participants. Each time blood is drawn it will be tested for the antibodies diagnostic for celiac disease. 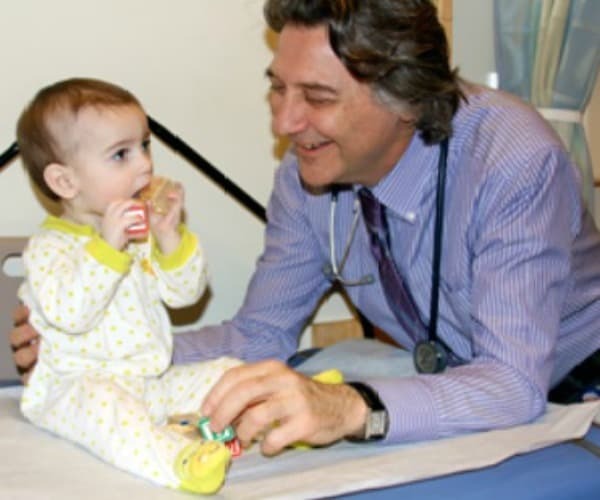 Thus, by participating in the study, each child will be monitored closely for celiac disease, which allows for early detection and treatment if necessary. As infants needed for celiac study must come from families with members who have celiac and many of you reading are part of such families or know such families, please feel free to share this article with them. If you have additional questions, please check out the CDGEMM website, especially the FAQs. If you still have questions after consulting the FAQs and wish to speak to someone directly about the study—including signing up your infant child (or future infant child)—please email the center at [email protected]. I was also provided two PDFs on CDGEMM—an update on the study and a recent newsletter—which I can share with you all if you’re interested. Please leave a comment if you are and I will email those two files to you. I’m really excited about this research by Dr. Fasano and his team; I hope you all are as well! Hi Judee–I always appreciate you reading and commenting. I believe that we need valuable info being shared in the gf community now more than ever and as much or more than gf recipes. Thank you for the kind words!